Helps build and maintain good practice in the museum. Provides a gateway to deeper exploration of interactive technology. Based on 30 years experience delivering system to heritage organisations. Supports MLA accreditation documentation, monitoring and reporting. Scalable system to suit museums of all sizes. 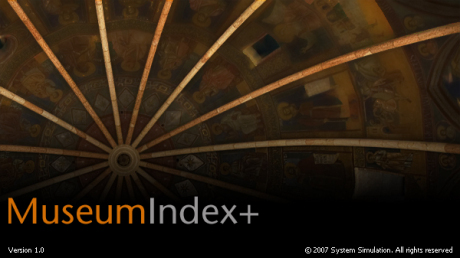 System Simulation is a Spectrum Partner and MuseumIndex+ is Spectrum Compliant. MuseumIndex+ is a central component of our CollectionsIndex+ suite of software - designed for museums, galleries and other cultural institutions. It provides an excellent basis for maintaining high standards in the management, documentation and care of collections. The MuseumIndex+ user interface is a Windows desktop application. There is also a simplified Web Edition which is accessed through a web browser and provides the core functionality of the system. MuseumIndex+ supports multi-media and public access facilities - providing output to kiosks and websites - and can interface with Content Management Systems. MuseumIndex+ is the latest generation of our museum collection management system, developed to meet the needs of clients that include the British Museum, the Victoria and Albert Museum and the Royal Academy. The system has been modelled specifically to support modern museum management procedures. MuseumIndex+ incorporates the wealth of cataloguing and search features, terminology and thesaurus controls that our users enjoy. There are new features included that specifically support SPECTRUM and assist UK museums and galleries aiming to achieve MLA Accreditation.